Sign Me Up For Fab Updates! This is the second Work In Progress photo I have posted. I am well into the first colour layer now. I’m still feeling my way round this one but I do feel it is starting to pull together. The colour is used quite thinly – with a mix of 2 parts OMS to 1 part walnut oil. I am mainly using Winsor & Newton artist grade oil paint but I have been moving over to Michael Harding artists oil colours – beautiful handmade oil paint. I do have to stress that I’m not saying this is how you should paint. I’m learning all the time myself – I always will be learning – you never stop. All I am saying is this works for me but my technique changes all the time. There are many ways to use oil paint, this is just one. Of course, there is more to come very soon. Thank you for your interest and the fantastic comments. 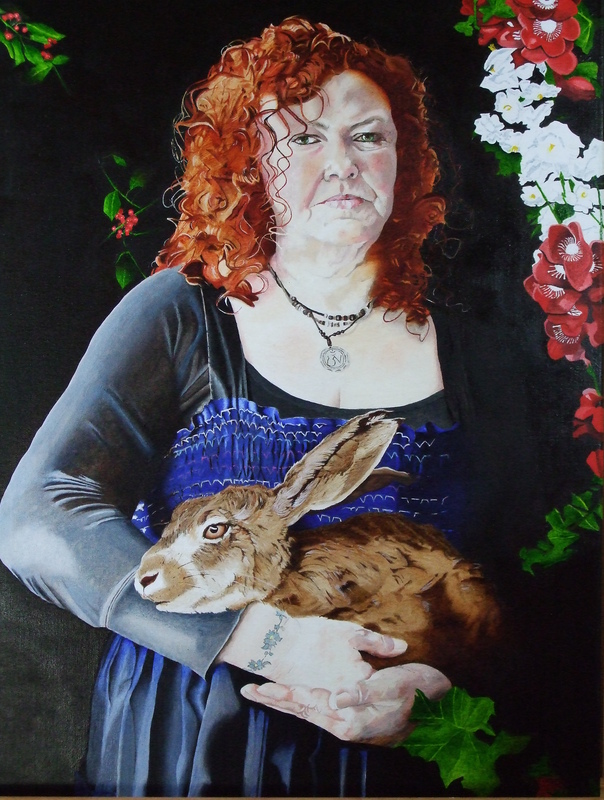 In my last post https://stewcrowther.wordpress.com/2014/04/17/lucinda-and-the-hare/ I mentioned that I had started another painting. I also said I would be showing some Work In Progress shots so here is the first one. I usually start with a monotone underpainting. 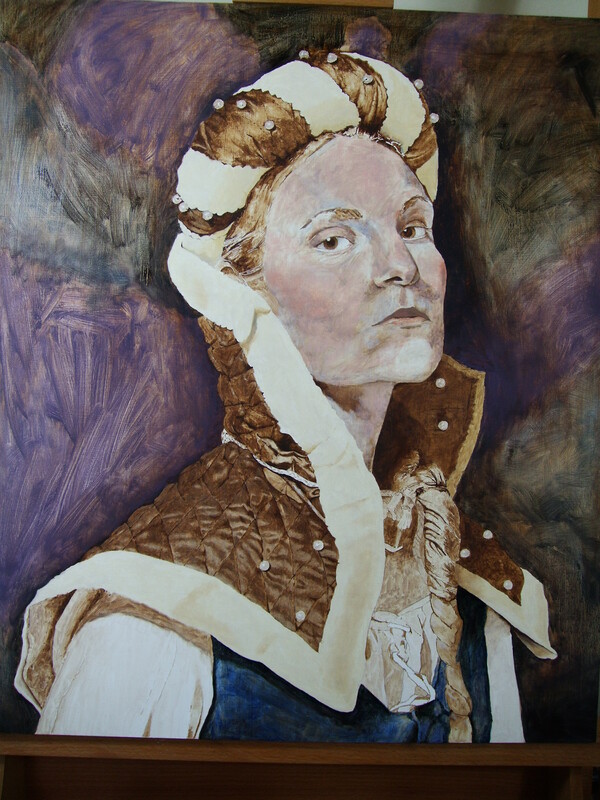 There are several different types of underpainting, such as verdaccio (usually in shades of green) and grisaille (usually in shades of grey). I normally use a brunaille (shades of brown). Brunaille is a less common method than paintings executed in grey (grisaille), though more common than those in green (verdaille). 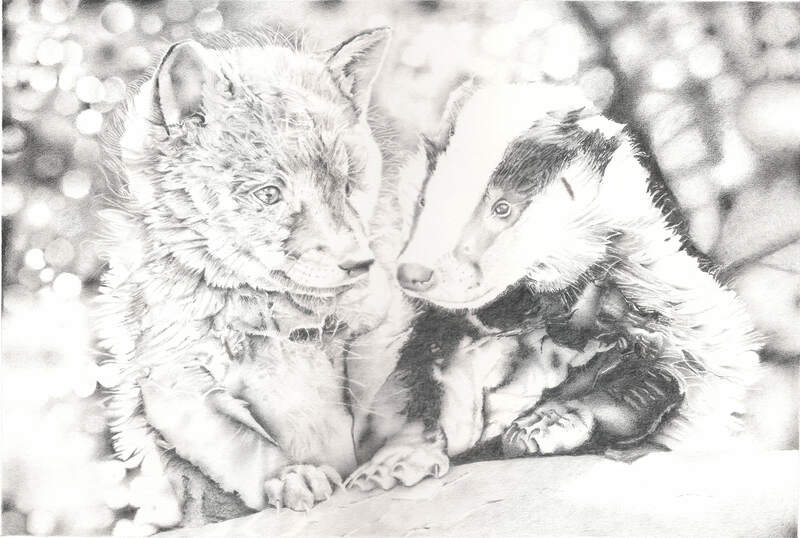 I do this firstly to help define values – light and dark. And secondly to lay a foundation in preparation for glazing layers of colour over it. At this stage I use OMS (odourless mineral spirits) to keep the paint thin help it flow. For later colour layers I will introduce oil (I use walnut oil) – increasing the amount with each layer. The beautiful model is Danielle Fiore. I will post more WIP shots very soon. Thank you for all the lovely messages about the cancer. I had a call from the nurse the other day with results from the PET and CT scans. She told me I also have lung cancer again along with the bowel cancer. I will know more after a meeting with the surgeon on the 2nd May. I guess I am going to have to call this painting finished. I’ve just noticed there is quite a bit of glare on this but I think you get the idea. I’ve had this on the old easel since last year (2013) (now it’s on the new easel 😉 ). The problem was mainly because I started this painting and then found out I had lung cancer again. I had the operation in October so it was late in the year (December) before I could continue with this one. 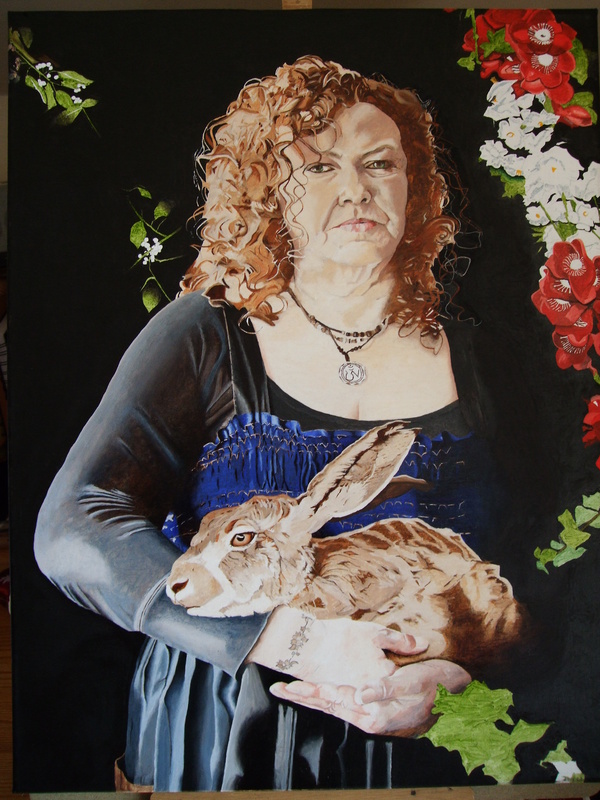 Then this year I have found out I have bowel cancer again just as I was starting a new painting. I’m going to keep going while I can. I’ve had the investigative operation, MRI scan, CT scan, PET scan and colonoscopy so I should be going in to hospital for the operation anytime now. With the new painting, I will try to post some process shots as I go along. It is something I have been saying I would do for quite a while now. It’s been quite a while – even for me. So I thought I would show you my two latest babies. This is a drawing in graphite 12×8 on 15×11 paper. My operation went well and the cuts/scars are healing nicely. I can’t say I’m cancer free yet but at least the operation is over with. I must say sorry for not being able to visit everyone’s blogs recently. Hopefully things will look-up in 2014. Now I just need to finish the painting I started before all this started…. So I have managed to get another photograph of this work in progress. I’ve still got lots to do but at least it’s another layer done. 1) It’s secondary cancer just in the lung where he will be able to put more staples inside and then once again cut out more of my lung. 2) It’s primary cancer (which he doubts but always possible) where he will remove what is left of my lung. 3) It’s secondary cancer which has spread in which case he won’t operate as there is nothing they can do for me. Not too keen on No3 option (not that I actually have an option)….lol. In fact, it is option No1 that gets my vote. We do not know which of these it is yet. I am going to have a PET scan (there is a lot they cannot tell from the CT scan) today 1st July. They will be phoning me tomorrow with the results. After which I should be in hospital very soon. So, if things go OK, I should have more of the painting to show you as soon as I can. 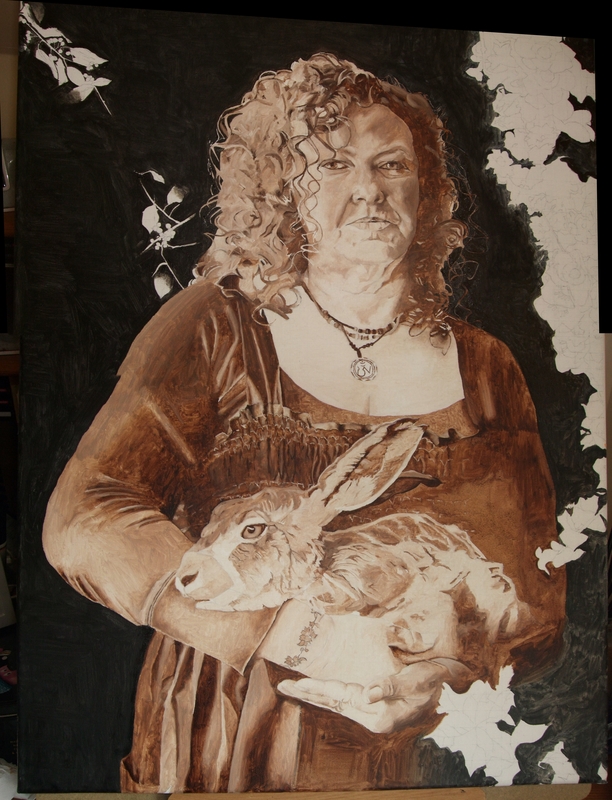 Underpainting of Lucinda and the Hare. I remember saying quite a while back that I would try to post some Work In Progress shots. And in typical form, after starting this painting I forgot to keep taking photographs. But here is a photo that I did remember to take. I am painting this oil paint on linen canvas, 24 x 20 (I could be wrong about size). 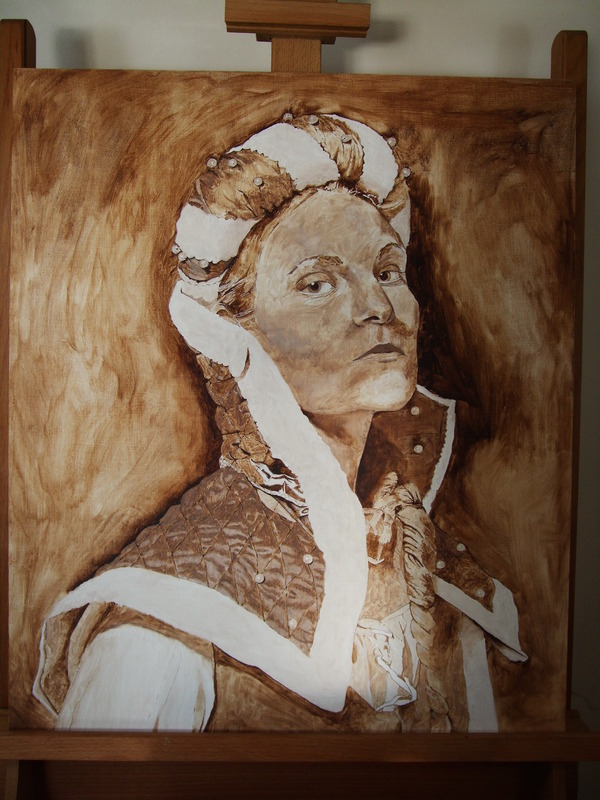 I’ve started with a burnt umber wash for the underpainting using odorless mineral spirits. The next layers will be done using a walnut oil and OMS mix. I know what I want in my head and usually I get there but I do sometimes walk down other pathways that open up along the way. By the way, as you can see (for those that have been here before), I have a new site. I just thought it would be good to have a change. Please let me know if I’ve made any awful errors – I did change things quite quickly. I remember thinking ‘This is going a little bit too smoothly. I’ve probably spelt my name wrong or some other glaring mistake’. Anyway, thank you for having a look. I will try to remember to get more photos along the way as this work progresses.